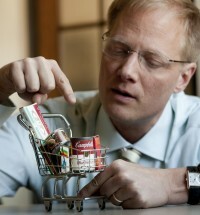 Video: From Mindless Eating to Mindlessly Eating Well: Brian Wansink at TEDxUVM 2012. Video: Brian Wansink Mindless Eating Interview. Video:Brian Wansink explains his famous "Bottomless Soup Bowl" experiment. Brian Wansink will change how you eat – in a painlessly good way. He is a behavioral economist and food psychologist, perhaps the foremost expert in changing what and how much people eat. After helping introduce the 100-calorie pack and launching the Smarter Lunchroom Movement, he published the transforming book, Mindless Eating, showing people how to eat less and eat better without thinking about it. Wansink has spoken to a variety of groups and would be an ideal choice for corporations, universities, schools, and organizations. His expertise as a food psychologist and economist make him an ideal keynote speaker and workshop leader for both businesspeople and students alike. He is the lead author of over 100 academic articles and books on eating behavior, including the best-selling Mindless Eating: Why We Eat More Than We Think (2006) along with Marketing Nutrition (2005), Asking Questions (2004), and Consumer Panels (2002). From 2007-2009 Wansink was granted a leave-of-absence from Cornell to accept a Presidential appointment as Executive Director of USDA’s Center for Nutrition Policy and Promotion, the Federal agency in charge of developing 2010 Dietary Guidelines and promoting the Food Guide Pyramid (MyPyramid.gov). While there, web hits to Dietary Guidelines increased 44% to 5.4 million/day, and he was named ABC World News Person of the Week. Wansink’s award-winning academic research on changing eating behaviors has been published in the world’s top marketing, medical, nutrition and obesity journals. His results have been presented, translated, reported, and featured in television documentaries around the world. He has now launched the Slim by Design Movement – to help us eat better while also asking the restaurants, grocery stores, and our companies and schools to help. 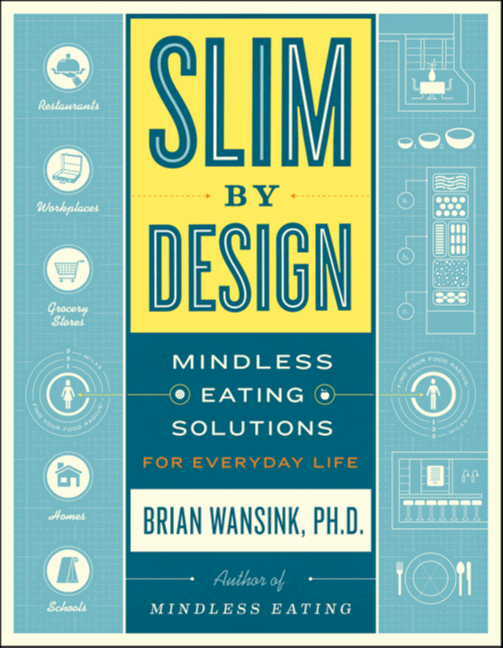 In SLIM BY DESIGN, Wansink uses cutting-edge, never-before-seen research to show that the answer isn’t to tell people what to do to lose weight—it’s to lead them to make the right decisions by designing their food environments cleverly! He offers innovative, inexpensive design changes that make it mindlessly easy and profitable for people to eat healthier. The concept of SLIM BY DESIGN is visual because the changes are real; they’re physical. Groundbreaking changes to lunchrooms, restaurants, grocery stores, and homes will be vividly illustrated with cartoons, illustrations, charts, graphs, floor plans, and other compelling visuals. Each chapter will be stuffed with fresh, never reported results and specific “Oh wow,” actionable insights. Interestingly, while he is Director of the famed Cornell Food and Brand Lab and is the former White House-appointed Director in charge of the 2010 Dietary Guidelines, he is also a former amateur stand-up comic and currently plays tenor saxophone in a rock band and in one of those fern-bar, Ella Fitzgerald jazz quartets. An Iowa native, he lives with his wife and three daughters in Ithaca, NY where he enjoys both French food and French fries.